Auto Tracking & Depth Setting Gauge Means Easier Use - The 975 Combo Groover includes new, patented auto tracking technology for significantly easier grooving. Whether you're doing machine-powered or manual grooving, the AutoTracking gauge keeps the pipe automatically engaged to the groover throughout the grooving process. The 975 also includes a permanent depth setting gauge for quicker, repeatable set-up. Less Hand Force Required - When manually roll grooving, the 975's 55% higher gear reduction means less hand force required versus competitive manual roll groovers. This is especially helpful for over-head roll grooving. Durability And Portability - A tough, ductile iron construction means the 975 can absorb job site abuse and provide accurate grooves time after time. A cast-in handle makes the 975 easily portable to and from the job site. 1 ¼” – 6” Schedule 10 and Schedule 40 steel, aluminum, and PVC pipe. 1 1/4" – 6" Schedule 10, 1 1/4" – 2" Schedule 40 stainless steel pipe, 11/2" – 3" Schedule 80 PVC pipe. With roll change, 2" – 8" copper tube (Type K, L, M, and DWV). Depth Adjustment: Adjusting screw and integral, index depth gauge. Actuation: Feed screw with 1/2" ratchet wrench (included), or any 15/16" hex wrench. 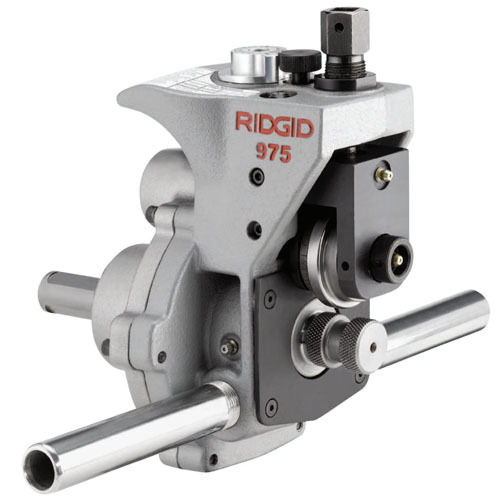 Power Drive Mounting: RIDGID 300 Power Drive 38/57 RPM (reverse direction only).